The Cape Winelands is only a short drive from Cape Town. The region is known for its picturesque valleys and award winning wines. There is more to the Cape Winelands than wine tasting and breath-taking views. Here you will find something for everyone. From nature reserves to natural hot mineral springs in Montagu and top mountain bike and hiking routes. You can fill your picnic basket with locally produced cheeses, olives and export quality fruit and organic produce in Bonnievale and Ceres. Drakenstein municipality offers historical charm, architectural heritage, wine and fruit farms and breath-taking scenery. Revel in beautiful fynbos-rich walks and hiking trails, or take a relaxing drive through the countryside. Stellenbosch is synonymous with beautiful natural surroundings, historical buildings, and wine. Experience the old-world charm while rubbing shoulders with a bustling community. Witzenberg is surrounded by the majestic Ceres mountains. The region has positioned itself as an affordable family travel destination that focuses on adventure tourism and sports tourism. Breede Valley is one of the largest wine-producing areas in the country as well as producing the largest annual quantity of table grapes in the southern hemisphere! The region also highlights the natural environment such as the Karoo Desert National Botanical Garden, canoeing and other adventure sports. The Langeberg region is amongst the leading wine regions of the world and a colourful kaleidoscope of scenic beauty which includes the breathtaking Langeberg mountain range, the Breede River and never ending vineyards and orchards. 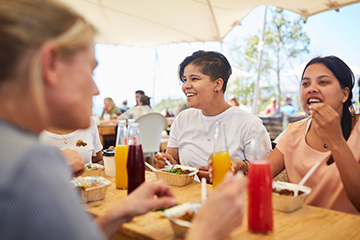 We’ve put together a list of some of the top things to experience when visiting the Cape Winelands District. Tantalise your taste buds and enjoy fresh and locally produced food and world-class wines. Get the whole family involved while enjoying one of these thrilling outdoor activities. relax in natural hot water springs in Montagu. If adventure sport is your thing, then be sure to try one of these activities when you're in the area. Canoeing and river kayaking on the Breede River. Hiking and mountain bike trails. 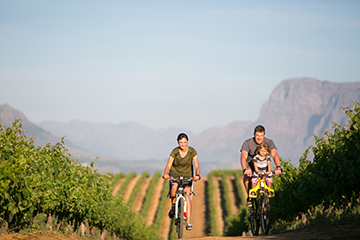 Experiencing the beauty of the Cape Winelands region doesn't have to break the bank. Here are some budget friendly ideas you can try when visiting this top tourism destination.